We are now working past the 2 miles of knitting part of the year. 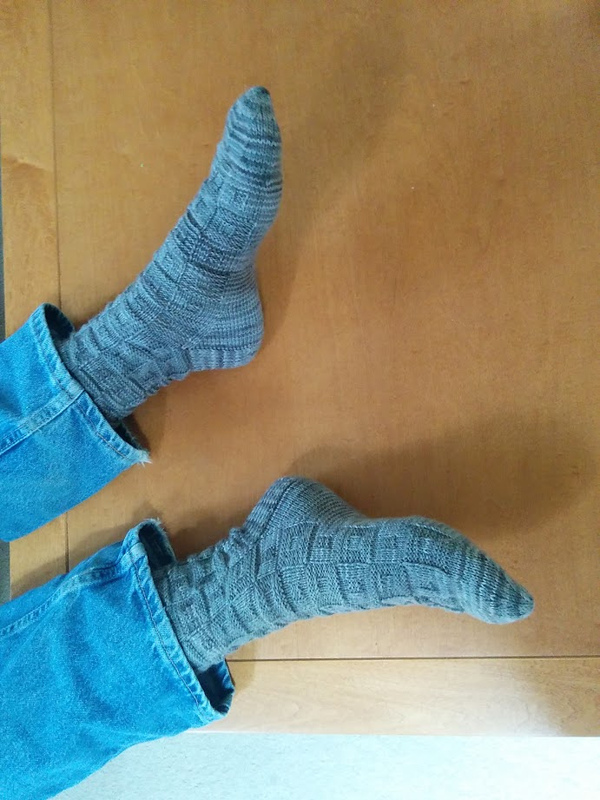 Ok so this year in addition to getting married, and apparently resuming cookie baking, I also joined a sock knitting competition called Sock Madness. Yes that’s right, the lady that whined about how bad her Second Sock Syndrome was in April of last year with the prior experience then of one pair of socks that took nearly a year to finish. 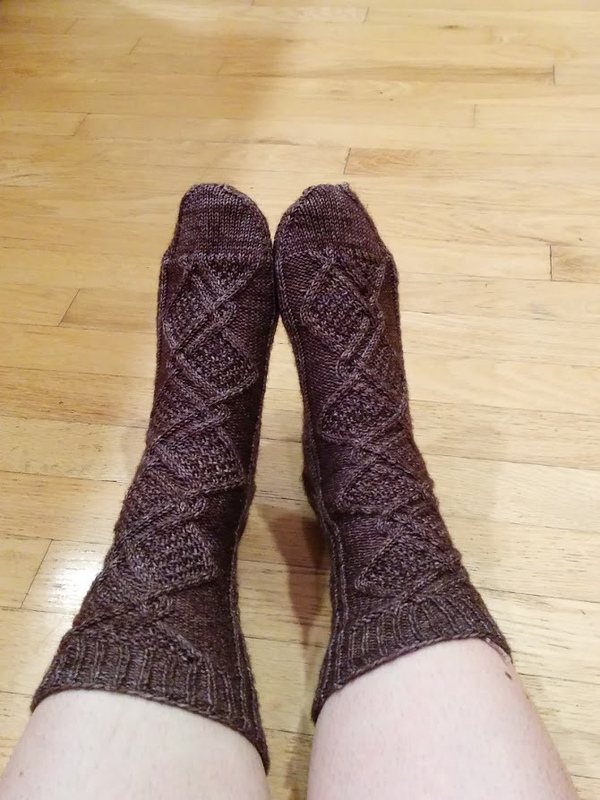 Well last year I finished three whole pair of socks, for a new total of four pair, and then pair five was the first project of 2015 so I was on a roll. So first up, you had to make a reasonable effort in the qualifying two week round. Apparently I’m still sorting out gauging correctly, so the first pair were a bit large and now belong to Ben. After that you get assigned to a bracket team, with people that should be approximately the same skill/speed as you are. My team is Purl, and the first thing most of us commented on was how much we don’t like purling. And then it was on to the competition rounds. The first pattern in the competitive rounds was top down and cabling. Only 32 members of the bracket team would advance. 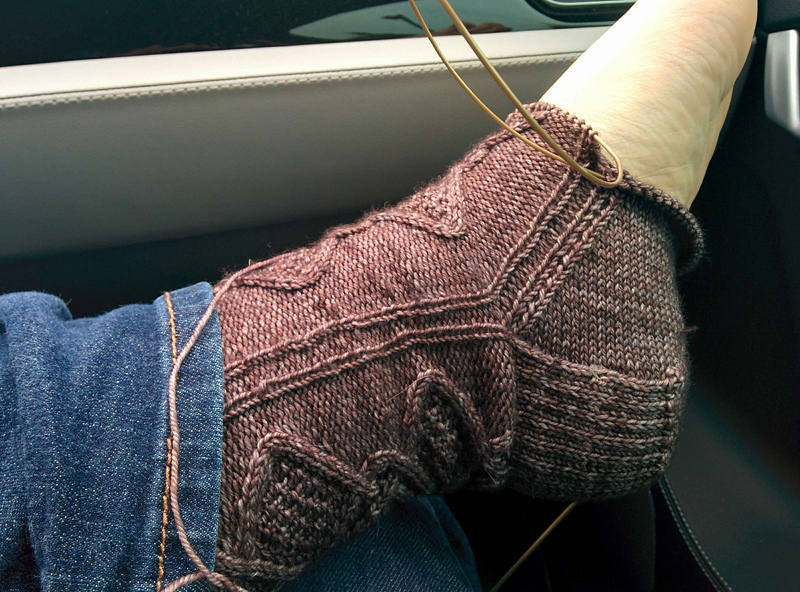 So while we did take a drive down to Oregon to see the Spruce Goose, I was knitting away the whole way. Wanted to make sure these fit, so I tried them on a time or two. The second sock, complete with the kitchener stitch toe (which was required so I actually did) was a bit tight in the leg. So I knit the leg of the second sock on a bigger needle. So my submitted socks were not exactly matched, but did qualify. 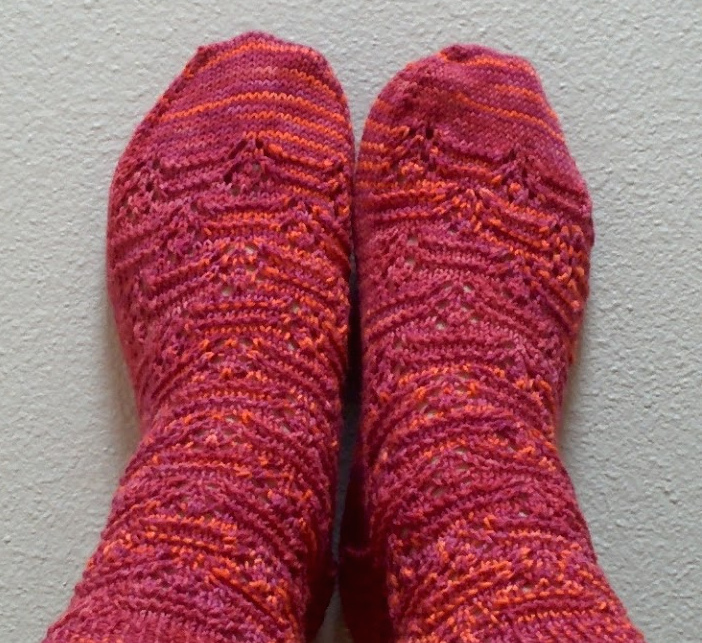 Next up, was a pair of toe up socks with lace. These knit up so fast the round didn’t even take a full two weeks for 25 members of the bracket team to advance. 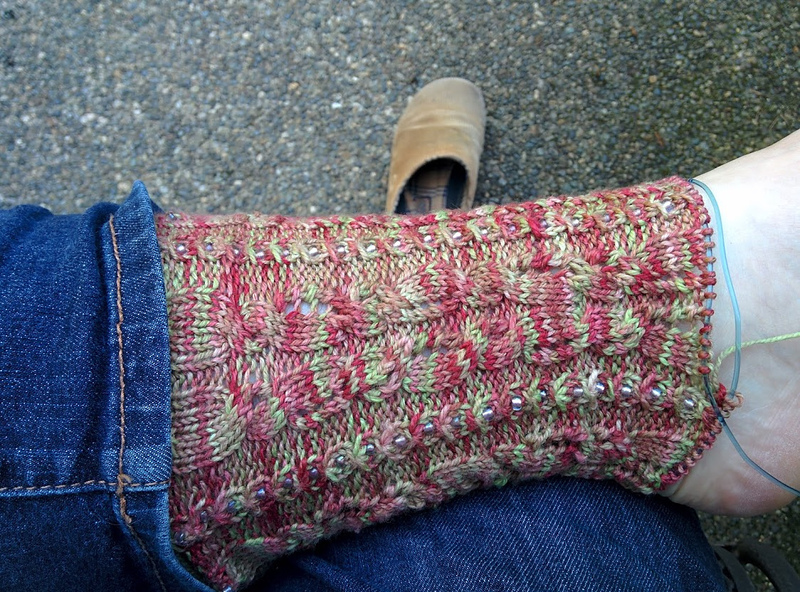 This round the sock is top down, both cables and lace, AND BEADS. Oh… and a different gusset decrease too. Technically I am beading a bit more than required by going all down the leg, but this is shaping up to be some great socks. I hope I’m one of the 17 from the bracket team that advance! This yarn has some cashmere in it. I’m going to feel like I have fancy feet! Now how I convinced myself to do this whole madness was partially the pile of sock weight yarn in my stash, the prompting of a fellow knitter and the fact that I could really use more awesome socks. (Though not necessarily for the TSA) Which was why I had actually finished the first sock in my pair of first colorwork socks just prior to joining in Sock Madness. PS – A Word about Brackets Teams: I was soundly informed that while Sock Madness calls them teams, because you are knitting against your team they are actually brackets. I say… who cares so long as you can explain it.